According to Forest Department in India, a significant portion of the population living in villages on the outskirts of tiger reserves not only have never seen a tiger, but would not recognize the big cat if they did happen upon a close encounter. In interviews, it was determined that villagers had heard of the tiger but most do not now what color a tiger or a leopard is or which has stripes and which has spots. They can not distinguish a growl from a roar. Tiger reserves in the state have a high rate of human-animal conflict. People when confronted with a tiger either die or are left with crippling injuries. The tigers face a backlash and the endangered cats in the Pilibhit reserve have even been poisoned. In many of these cases, the villagers resorted to harming the tiger because they not only don’t know what to do, they are not sure what animal they have encountered. “Whenever a tiger strays out of the forest and we start a rescue operations, there is a crowd of people from several villagers just to see a tiger,” said WWF-India UP landscape coordinator Mudit Gupta. This curiosity and need-to-know about the tiger sparked the idea to offer basic tiger education to the people living in the villages surrounding the reserves. Forest officers have been hosting workshops on big cat behavior in the wild, but getting the people out to actually see a big cat is essential to the training. “One can escape the tiger only when one knows the animal,” said on forest officer. The villagers will be taken to Lucknow Zoo by primary response teams and protection squads formed by the village. They will also be trained to handle human-animal conflict. A person should avoid squatting on the ground as that’s when most attacks by big cats take place. 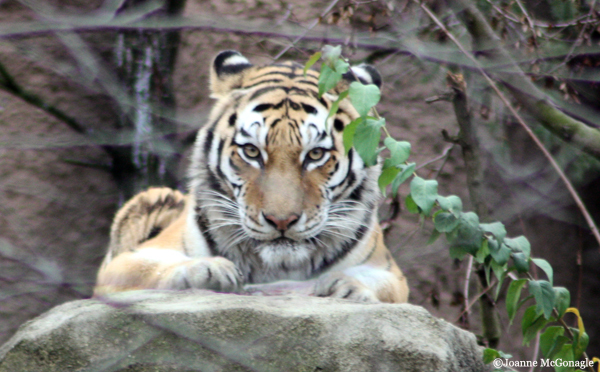 When a person is squatting the tiger is thought to mistake a human for a quadruped. Wear fluorescent colors while entering the fringes of the forest. Big cats will avoid you and it will be easier for others to locate you. Leopards are shy and cowardly and will hide in thickets at the slightest sound whereas the tiger is fearless and will come out into the open if provoked or directly confronted. If left alone, a tiger is quiet and shy and will slowly cross your path keeping on their way quite possibly without you even know they were there. Let’s hope these workshops help save human, tiger and leopard lives. what an excellent teaching aid; I’d take this class myself to gain more knowledge; I’m sure I dont know 90 percent of what I could know about either one of these amazing big cats ! ?? ?